Low profile cover designed to attach to the EDB45S style floor boxes. 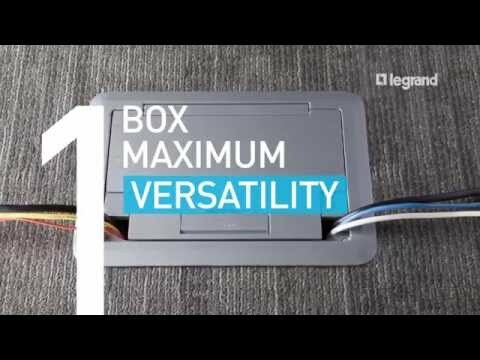 Each cover is made of die cast aluminum and is equipped with a durable hinge allowing the cover to rotate open 180 degree, a 1/4" deep recessed area to accept the finished floor covering, and two (2) slide egress doors that lock in the open position and automatically close around the cables when the cover is closed. The cover assemblies are designed to sit flush with the finished floors such as: carpet, tile, and wood. In order to make the cover assembly flush with the polished concrete or terrazzo floor the EFB45-CTR (concrete/terrazzo) ring must be used (ring sold separately). The cover assemblies are available in six (6) powder coat finishes: black (BK), gray (GY), brass (BS), nickel (NK), aluminum (AL) and bronze (BZ).